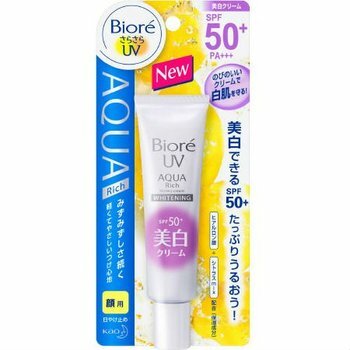 Suitable for face application, Biore UV Aqua Rich Watery Whitening Cream SPF 50+ PA+++ is formulated with natural Chamomile extracts to suppress melanin production and prevent age spots due to sun exposure for fairer, radiant skin. Contains Hyaluronic Acid and Mix Citrus Essence as moisturising ingredients to leave skin looking healthy with a rich, moisture feeling. Its texture is non-sticky and non-greasy. It works as a smooth makeup base to prepare skin for makeup regimen.